Ernest Stuart, founder of the Center City Jazz Festival, performs during a mid-afternoon set with his quartet. 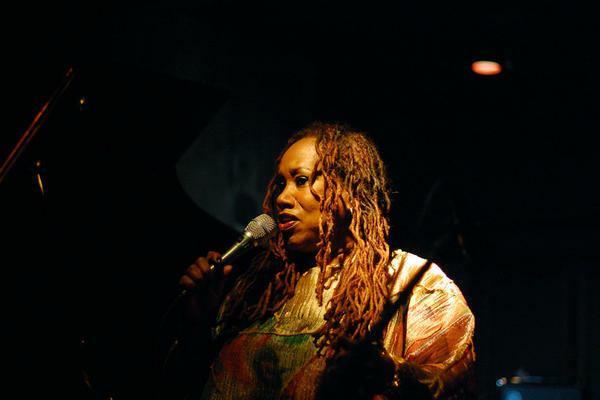 Vocalist Denise King performed at Chris' Jazz Cafe. 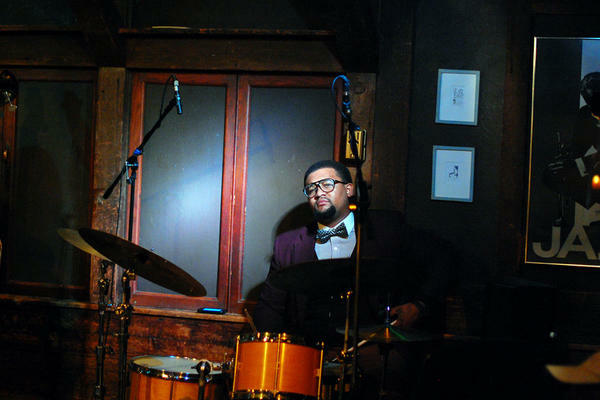 Drummer Khary Shaheed performed with Denise King. Luke Carlos O'Reilly played the Hammond B-3 organ at Time. 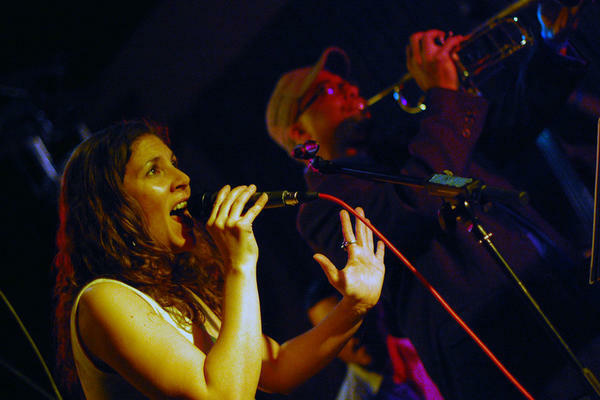 Vocalist Venissa Santi led a modern Afro-Cuban band at Milkboy. Drummer Joe Truglio brought his trio to Fergie's Pub, with Ken Pendergast on bass and John Stenger on electric piano. 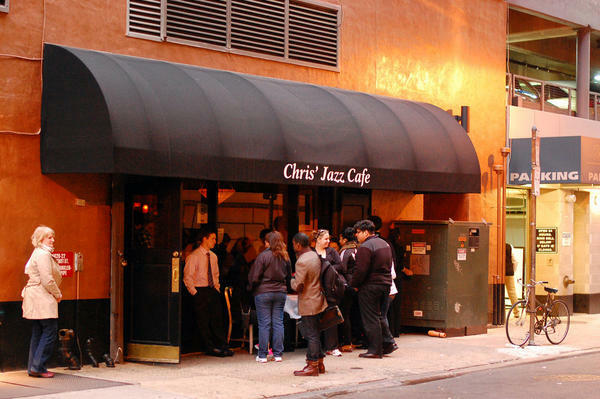 The scene outside Chris' Jazz Cafe on Sansom Street, after the last afternoon set and before Sean Jones' headlining performances. Saxophonist Wade Dean led a quintet in the very first set of the Center City Jazz Festival, featuring Anwar Marshall on drums. 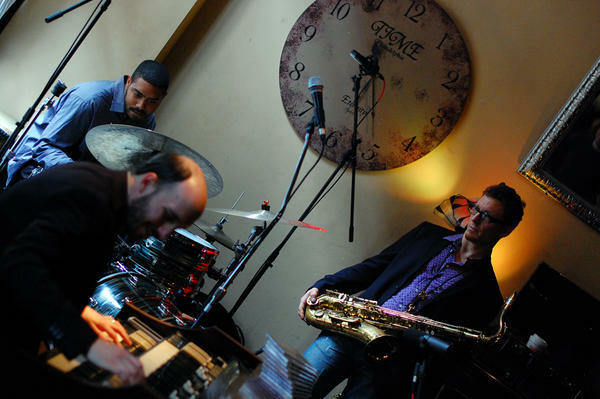 The trio Three Blind Mice, with saxophonist Victor North, organist Lucas Brown and drummer Wayne Smith, Jr., performs at Time. 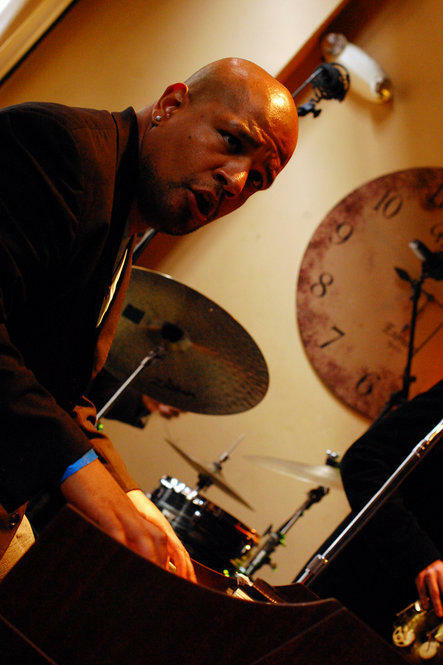 Pianist George Burton led a quintet, with Stacy Dillard on saxophones. 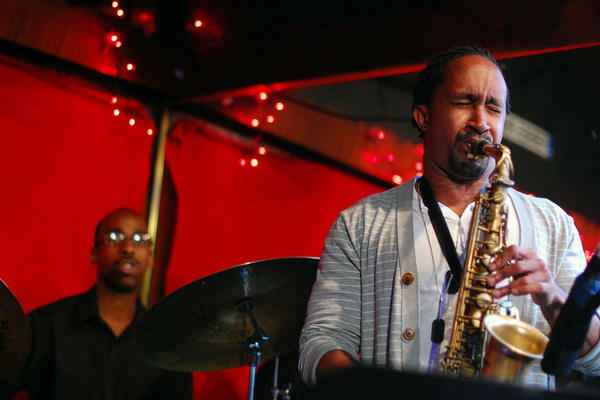 Now based in New York, Jaleel Shaw returned to his hometown for a trio set. For the next six hours, Dean, a saxophonist, and his fellow bandleaders would strive not only to honor the legacy embodied by Heath and others, but also to bring forward their own art, a music of today. There was a larger goal as well: to revive a year-round jazz presence in Philadelphia, where the jazz club scene has all but collapsed. 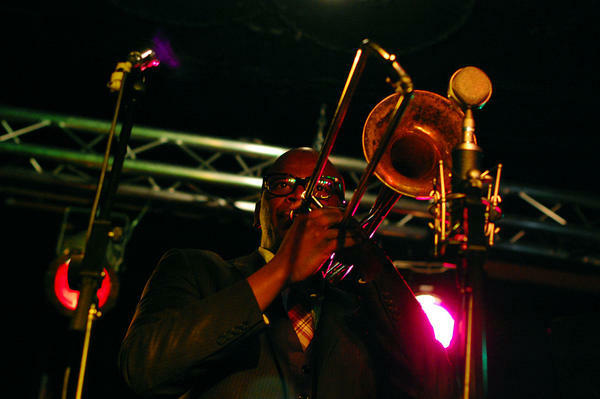 The Center City Jazz Festival is the brainchild of trombonist Ernest Stuart, 28. Buoyed by a Kickstarter campaign, which exceeded its goal of $16,000, Stuart took a cue from New York's Undead and Winter Jazzfests. On Saturday afternoon, he booked 16 bands at four venues within short walking distance. Of these, Chris's Jazz Café and Time Restaurant book jazz regularly. Fergie's, an old-school Irish bar, and Milkboy, a coffee shop and rock venue, do not. But for one day — possibly the most significant day for Philly jazz in years — these establishments came together for a grassroots showcase of one of the city's greatest cultural assets. "I'm so proud of my good friend Ernest," said drummer Justin Faulkner as the day ended. "This festival was what we needed to lift our spirits." Wade Dean concurred: "He did a damn good job. Ernest came through." The four CCJF venues are mostly dotted along Sansom Street downtown, near the stretch of Broad Street known as the Avenue of the Arts. (One venue, Milkboy, is on neighboring Chestnut Street.) Val Brown, a patron at Fergie's and an area resident in the '70s and '80s, recalled how Sansom was once blighted, a shell of abandoned industry, "the street you hurried past to get to Market Street." Today Sansom Street is hardly pretty — a narrow and often malodorous lane of dumpsters and parking garage exits — but also decently sprinkled with businesses. To walk here is to see immediately how events like CCJF can brighten urban spaces. Unfortunately, City Hall didn't bite. Stuart sought government help early on, but a meeting with officials "wasn't very fruitful," he said. (In fairness, he added, "We had just launched the Kickstarter a week before, and we'd only raised about $1,500 at that point.") To his credit, Mayor Michael Nutter held a press conference on Jazz Day (April 13, as declared by the U.S. Conference of Mayors) and spoke of his own personal stake in Philly's jazz culture. But in spite of this, the CCJF had to fend for itself. Stuart did line up advertising support from Yelp and Philadelphia Magazine; a donation from the coffee maker L'Aube Torrefaction; and free live sound and recording from Turtle Studios. Otherwise, he said, "We just went to the people, and the people showed up, just like they showed up today." Bassist Mike Boone, a mentor to many younger players in town, looks at Philly as an undervalued music capital. "When people think of us they think of Rocky, the sports teams, they think of cheese steaks and hoagies," he says. "Music is kind of way down on that list." But Philly music history is easily as rich as Nashville's, Boone noted, and its stylistic range is arguably broader. John Coltrane, McCoy Tyner, Lee Morgan, Benny Golson and countless others came from the city. The impact of organ greats Jimmy Smith, Don Patterson, Shirley Scott and Trudy Pitts is still widely felt. Gamble & Huff, the famed soul and R&B producers, pioneered a "Philly Sound" that rivaled Motown in influence, and many jazz musicians came on board as session players. All these elements converge to give Philly jazz a kind of gritty, groove-oriented populism, readily apparent at the CCJF. The city boasts a rich avant-garde legacy as well. It remains the home base of Marshall Allen and the Sun Ra Arkestra, who have done DIY music promotion for decades. 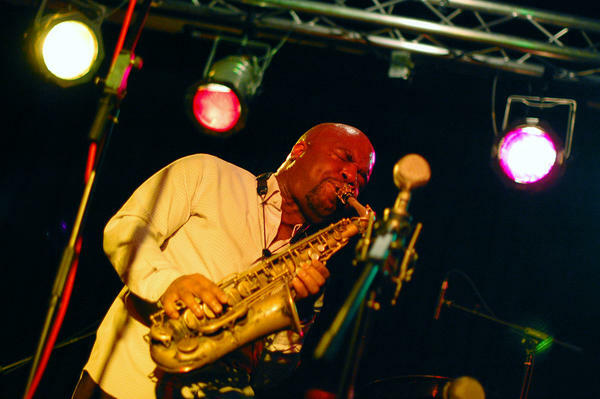 And some of Philly's more "outside" players were already engaged elsewhere on Saturday: A big band led by saxophonist Bobby Zankel was performing in collaboration with AACM leading light Muhal Richard Abrams. Ars Nova Workshop spearheaded the event as part of its ongoing concert series. Philly's network of left-of-center improvisers, not unlike their brethren in Seattle, have had some success tapping alternative spaces and forging opportunities through sheer will. 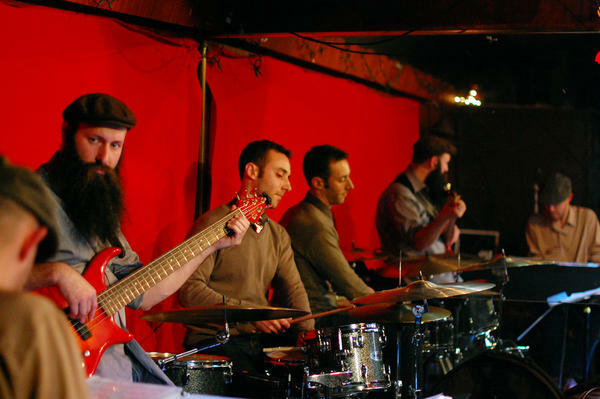 With the CCJF, might the straight-ahead jazz scene be poised to do the same? At Time, a four-year-old restaurant and bar with no bandstand, soul-jazz and Hammond B-3 organ ruled the day. Leading off was Three Blind Mice, a cooking and subtly inventive trio with saxophonist Victor North, organist Lucas Brown and drummer Wayne Smith. In fact, Chris' Jazz Cafe was the only venue with an acoustic piano. The Roland digital keyboard at Milkboy wasn't ideal, but the Fender Rhodes at Fergie's Pub lent a warm and enveloping modernism to bands led by tenor saxophonist Dahi Divine, bassist Alex Claffy and drummer Joe Truglio. Years ago, when jazz could be heard in Philly's innumerable neighborhood bars, the Rhodes was a necessity. These days it can be a benefit. At Milkboy, festival founder Stuart led a group with Boone, Faulkner and pianist Jason Shattil, courageously featuring his trombone as the only horn. Vocalist Venissa Santí followed with Afro-Cuban jazz of high spirit and technical accomplishment. Then Faulkner returned for a smashing trio set led by altoist and Roy Haynes bandmate Jaleel Shaw, with Luques Curtis on bass. By the time the formidable young pianist George Burton played around 5 p.m., Chris' was turning people away (including me). "It's difficult with the four-venue thing," said Terrance Leach, manager of Time, earlier in the day. "So many tickets sold, and I'm a little worried that everyone's going to rush to one venue at once." Problems like these have bedeviled the New York festivals, but they're good problems to have. You could barely squeeze into Chris' for the 8 p.m. headlining set by renowned trumpeter Sean Jones. (Lo and behold, there was Burton on piano, Luques Curtis on bass and the indefatigable Faulkner on drums, with Brian Hogans on alto.) Jones, an Ohio native now based in Pittsburgh, had a moment when he looked out and saw Dolores Fambrough, widow of recently-departed Philly bassist Charles Fambrough. "My first professional recording was with Charles Fambrough," he said, eyes welling up. "He was like a father to me, and you are like a mom." The impact of losing elders like Fambrough can't be overstated. Nor can losing community-fostering venues like Ortlieb's Jazzhaus (though Ortlieb's Lounge is now presenting jazz once a week). Younger players, in Philly and everywhere, face tough odds as they build careers. But Philly's resounding success stories are many. Faulkner, now playing with Branford Marsalis and Kurt Rosenwinkel, is just the latest. Rosenwinkel belongs on the list himself. So do Uri Caine, Christian McBride, Orrin Evans, Ari Hoenig, Joey DeFrancesco, Jaleel Shaw and Johnathan Blake. There's no reason to think the list will stop growing. 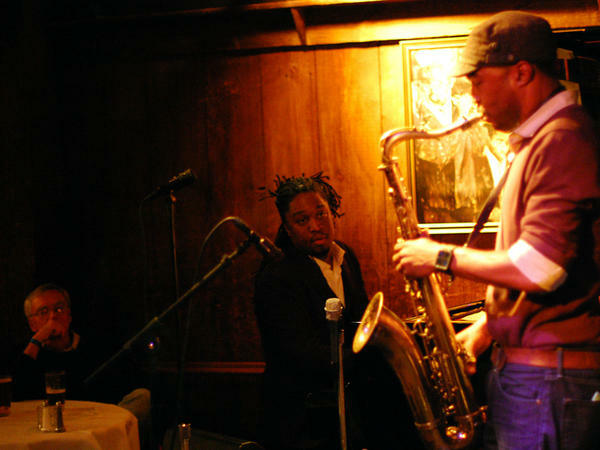 The question is whether Philadelphia can rebuild a bustling jazz-club culture of its own. Standing in Chris' waiting for Sean Jones to start, Ernest Stuart seemed elated, no doubt exhausted. "There are so many unknowns with an event like this," he said. "I woke up this morning just full of nerves. But I was so pleasantly surprised. "The people coming up to me are people I don't know. I'm so happy that they gave the music a chance, and they loved it. It's up to the venues to keep this momentum going." David R. Adler is a freelance writer formerly of Philadelphia.